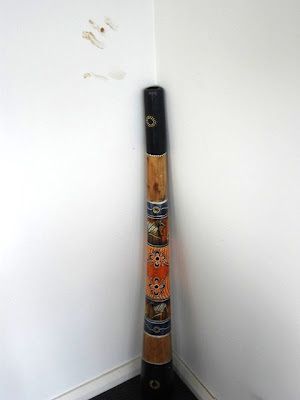 A few months ago, I found a didgeridoo in the dirt behind my office. Being a large and awkward item, it seemed a most unlikely object for someone to lose. It's not like dropping a glove, which might go unnoticed until the next cold snap - I just think one would be very aware of suddenly NOT carrying a 3 foot long brightly painted wooden pipe. I was forced to conclude that it must be stolen and that the perpetrator felt suddenly conspicuous, though I could not imagine why one would ditch such an object in this particular location. I toyed briefly with the idea of turning it into lost and found, but in the end my love for a found object outweighed all of my moral qualms. Has the ghost of some unsettled ancient aborigine, adrift among the apartments of St Leonards come to reclaim his lost musical instrument? And why had he been dipped in chocolate ice cream...? I suppose I should be rather embarrassed that a very violent episode in a very public location exposed two deficiencies of vocabulary, but such is my delight at learning new words, that I cannot be bothered to feel ashamed for not already knowing them. When I first read the newspaper headlines about the disturbance at Sydney Airport, I had to ask a passing Australian what a 'bollard' was, this being the murder weapon in question. It quickly occurred to me that such an item is most likely called a bollard in America as well - I just never had occasion to have a conversation about one. Not being entirely familiar with the terms used for criminal misconduct in Australia, I misunderstood the evening news anchor and believed the bikies gang members had been charged with being 'in a fray', which in my vocabulary is synonymous with being in a 'fracas', and seemed a rather innocuous word to apply to the bashing in of a man's head with a large metal object. However, upon reading about the incident further, I realized the bikies had been charged with 'affray', a word which still seems a frightful understatement. However, understatement seems to be a prevalent trend among Australian news reports, and I am increasingly of the opinion that such a practice helps to curb the intentional hysteria that is the cornerstone of modern American journalism. I have no doubt that had the incident occurred at LAX, it would have been described as a massacre. Of course, if it had occurred at LAX, the cops would have shot all the bikers and it would indeed have been a true massacre. Although understatement does not lessen the shock and horror of the facts, it does not further propagate those feelings. 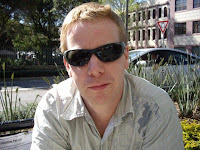 By using calming language, it is possible to move beyond the violence more quickly and get down to the more important matter of pointing fingers at various government entities for their lack of responsiveness and to promptly introduce new legislation making it illegal to be a member of a bikie gang. "It doesn't say much for the millions of dollars we have spent on airport security, nor does it say much, in the event of a fair dinkum terrorist attack, what would happen." One of the advantages – if you can call it that – to moving as much as I have is that I am seldom one of the people who get ‘left behind’. Distracted by the novelty and busyness of relocation, I am somewhat sheltered from the pain of missing my friends. My daily routine is new. My surroundings are unfamiliar. I am not sharply aware that the people I love are absent because they have never been a physical part of this present. There are friends that come from history - for better or worse, kept because they are old and irreplaceable. Like antique furniture, they might look out of place in a modern living room, but they provide a feeling of continuity and make for good conversation. There are friends that come from circumstance - coworkers, neighbors, or club members, essential but often superficial. Like a favorite new pair of shoes, they are comfortable and stylish, but eventually they will wear out and need replacing. Then there are friends that come from intense mutual admiration. Like a warmly lit mirror that magically softens wrinkles, blemishes and character defects, they reflect a self portrait of confident radiance. Richard has been this sort of friend to me, and today he is moving to London. I can almost hear the sucking sound of the emotional vacuum created by his departure. I feel like a better person when I am in his company, and his absence will be sorely felt. My own self indulgence is preventing me from celebrating his opportunity and wishing him well. Indeed, I have been quite nasty about it. It's not unusual for me to see groups of holy people on my morning commute through Sydney's Central Business District. I often see Franciscan Friars or Buddhist Monks waiting for the bus in front of St Andrew's Church. So I didn't think twice when I saw cluster of nuns in starched white habits walking through the Town Hall station. Until I noticed that they were surrounding a nun with a black wide brimmed hat who was wearing a deep purple robe. I was suddenly compelled to investigate their footwear: a pair of black combat boots, some fishnet stockings, a set of take-me-back-to-Kansas slippers, a pair of snake-skin stilettos. Another quick glance before they vanished behind the closing doors of the train to Bondi Junction revealed a shaggy red beard. Ah yes...The Parade is this Saturday...I reckon The Sisters of Perpetual Indulgence are hosting morning tea. Can any of my antipodean readers enlighten me as to why it is that in Australia, Mardi Gras falls on a Saturday in the middle of Lent?